Description: Utilizing a blend of timeless craftsmanship and classic design, the ever-popular Citadel brings unsurpassed sophistication and shapely appeal. 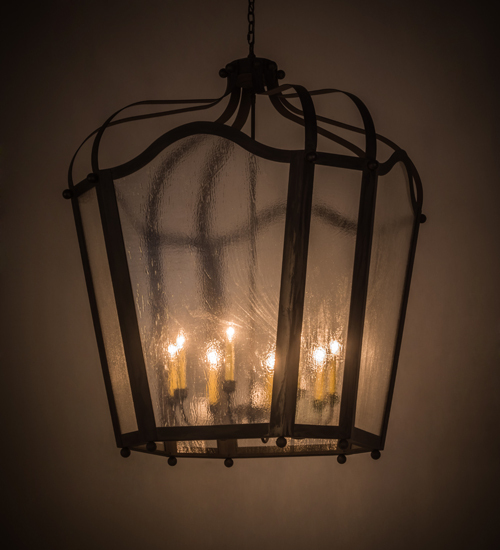 Evoking a dramatic effect, beautiful ambient light is evoked through Clear Seeded Glass which reveals an 8-light faux candelabra featured within this pendant. Citadel is enhanced with stylish frame and hardware featured in a Costello Black finish. The fixture is handcrafted by skilled artisans in our 180,000 manufacturing facility in Yorkville, New York. Custom options include various sizes, colors, designs and dimmable energy efficient lamping including LED. The pendant is UL and cUL listed for dry and damp locations.